Creative Safety Supply is a business organization specializing in the production and distribution of industrial safety products. Our mission statement is clear, “to be creative, positive, and help our customers build a safe work place,” but we also believe in helping those who are out for the better good of humanity. By teaming with non-profit organizations nationwide, Creative Safety Supply has been able to form creative, positive, and safe environments for these organizations to complete successful events, benefiting their causes. Portland Community College: Opportunity – Then. Now. Always. Since the 1950's, the automotive service technician has played a major role in the American society. We depend on them for anything from our basic to our most complex automotive needs, as well as to ensure our vehicles get us where we need to go safely. Without them, many of us would be walking to and from, instead of driving. 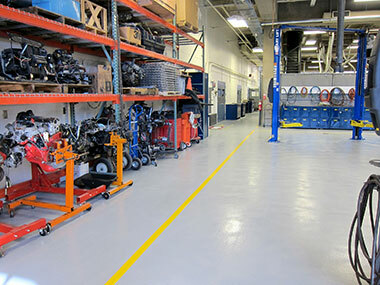 For over 40 years now, the Automotive Service Technology department at Portland Community College (PCC), located just outside of Portland, Oregon, has provided an opportunity for students of all sorts to become a skilled automotive service technician with the fundamental skills necessary to have a successful career. After a recent renovation, the staff at PCC came to Creative Safety Supply with a vision to ensure the safety and well-being of their students, for the long-haul. They had the vision, but needed help to see it through. After collaborating with the staff at PCC, we were able to put together a package that included SafetyTac floor tape, floor signs, wall signs, and a LabelTac label printer – all at no charge to the school. The donations have dramatically improved the safety and efficiency of the staff, students, and visitors to the PCC auto shop. Adding the label printer, will also allow the staff to keep up on regulations and continue to add any visual safety labels that they may need as new hazards appear. High school athletics are an important part of society, regardless of where you live in the U.S. So when the folks at the North Carolina High School Athletic Association (NCHSSA) reached out to Creative Safety Supply for help with their 100th year celebration, it was more than an honor. The non-profit organization has administered one of the most successful high school athletic programs in the country for 100 years now and what better way to celebrate than with a black tie gala to recognize a 100 years of service. 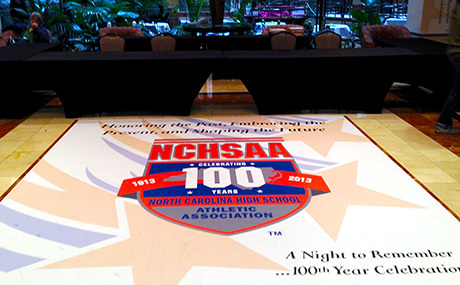 Our creative team was able to use the information provided by the organizers at the NCHSAA to create custom signage, banners, floor signs, and door clings that would not only enhance the experience of the event, but also make it safer and more efficient as well. For almost seven years now, the Liberty-Fit program at Liberty High School in Hillsboro has been helping adolescents understand the values of nutrition and physical fitness through running. This is a unique opportunity for students to gain physical, mental, and social heath improvements they once felt unobtainable. The program is designed to help uninvolved “at-risk” students feel apart of a community and share a common goal; completing the Helvetia Half-Marathon. The school does not require the students to pay the $150-$200 participation fee needed to fund the growing program, which now includes almost 200 students. 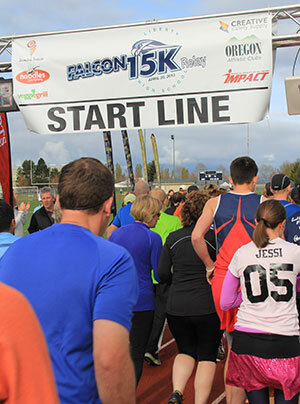 Instead, the school is supported by local donations and their big fundraiser the Falcon 15k Relay. This year, Creative Safety Supply was excited to join forces with the Liberty-Fit program and help keep a safe, organized relay for its participants. Through the use of our in-house sign and banner department we were able to make customized signs to aid runners in the direction of the race while warning drivers of the event. We also provided banners for the organizers to relay information to its participants. Our donations, helped keep costs down and provide a safe event for the runners. The high quality signs are also reusable which will allow the group to continue to feel safe running along the roads, even if it's simply for a training day. As Creative Safety Supply strives to provide safe and efficient work environments for all, Habitat For Humanity strives to provide decent, safe and affordable places to live for everyone in need. For us at CSS, the opportunity to help Habitat For Humanity was a special opportunity to give back to a non-profit organization dedicated to helping others, while keeping safety on the agenda. The Habitat For Humanity of Seminole County and Greater Apopka approached CSS in March of 2013, to help provide safety supply products for the Casselberry ReStore location. CSS was then able to donate 100% of the safety tape needed to safely mark the aisles of the new location. The Smart Stripe tape was used to provide a more pleasant experience for both shoppers and volunteers in the store. This combined effort to provide safety and efficiency to positive organization is a big part of our core values at CSS. Oregon Food Bank has a clear mission, “to eliminate hunger and its roots causes.” They work to bring communities together through food, education, and hope to those in need. OFB advocates for fair public policies, strengthening community food systems, while providing nutrition and garden education, helping citizens become for self-sufficient and resourceful. 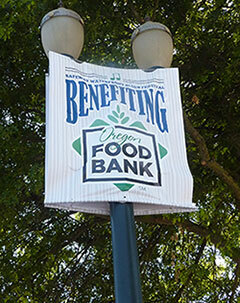 For every dollar donated to OFB, more than 94 cents goes directly towards fighting hunger. The organization has now become a model for others with similar causes. In fact, since the start OFB has kept 16 million pounds of food from being wasted. Creative Safety Supply is currently working with the Oregon Food Bank to overhaul their facility with floor marking and safety signage to ensure the safety of the hard working volunteers that help serve their mission. The Blues Festival has become a staple of downtown Portland over the Fourth of July weekend for years now. The event is put on by the Oregon Food bank, which last year alone raised over $900,000 and 100 thousand pounds of food. In total, since 1987 the event has raised more than $7 million dollars and over 1.5 million pounds of food for OFB hunger relief. The Blues Fest has been named one of the top ten U.S. Festivals and is a recipient of the “Ovation Award” as Oregon's best festival. With over 133,000 in attendance in 2012 the festival looks to continue its successful run. This year Creative Safety Supply was honored to have an opportunity to sponsor the event and contribute to an extremely worthy cause. Our custom sign department was able to put together signage for the entire event. From traffic flow to event and safety information, our team was able to coordinate with the event organizers to meet all aspects of the events needs.